Good day my lovely readers. I once shared a related tutorial on how to download paid android apps for free. Today's stroll, I would brief you on how to download paid blackberry apps for free. Now we can move on. So take a deep breath and stay relaxed as you enjoy this brief tutorial, bet me, there is a lot to gain from this. 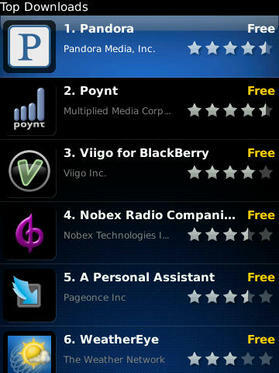 Well, I would brief you on the two sites that offer blackberry paid apps for free. Blackberry seeker is a very awesome and unique website in a cool platform. In the website, you can get almost all paid apps and theme free, unlike the default blackberry world that lay charges for some apps like voice recorder pro ($1.99), you can actually get it free on blackberry seeker. This website is highly recommended for all blackberry game lovers. Hadi Ismail blog is another great site in wordpress platform that helps to get blackberry paid apps for free. I would advice theme lovers to go for this site if you wish to download paid theme for free because they have awesome themes to offer. I must say it's strictly for theme downloads. To install the downloaded apps from the listed sites above, you'll need to sideload the extension into your device because it's extension would be in .bar format. For more details about sideloading, click here. Hope you found this tutorial helpful. If you got few problems, don't hesitate to let us know.